On Sunday 21st April 2019 the sun will rise at 07:48 and will set at 18:29. It's going to be quite a warm day, with temperatures reaching 26.8°C. Today is expected to be a dry day, with a very low chance of rain. There will be a gentle breeze in the air today, with a maximum expected wind speed of 18mph. On Monday 22nd April 2019 the sun will rise at 07:49 and will set at 18:28. It will be a mild day, with temperatures reaching around 17.3°C. A light shower is possible, 1mm of rainfall is possible today. There will be a gentle breeze in the air today, with a maximum expected wind speed of 11mph. On Tuesday 23rd April 2019 the sun will rise at 07:50 and will set at 18:26. It will be a mild day, with temperatures reaching around 20.8°C. Today is expected to be a dry day, with a very low chance of rain. It will be a very clam day today, with a maximum expected wind speed of 10mph. On Wednesday 24th April 2019 the sun will rise at 07:52 and will set at 18:25. It will be a mild day, with temperatures reaching around 20°C. Today is expected to be a dry day, with a very low chance of rain. It will be quite a breezy day, with a maximum expected wind speed of 19mph. On Thursday 25th April 2019 the sun will rise at 07:53 and will set at 18:23. It will be a mild day, with temperatures reaching around 16.5°C. Today is expected to be a dry day, with a very low chance of rain. It will be quite a breezy day, with a maximum expected wind speed of 20mph. On Friday 26th April 2019 the sun will rise at 07:54 and will set at 18:22. It will be a mild day, with temperatures reaching around 14°C. Today is expected to be a dry day, with a very low chance of rain. It could be quite a gusty day today, with a maximum expected wind speed of 27mph. On Saturday 27th April 2019 the sun will rise at 07:55 and will set at 18:20. It will be a mild day, with temperatures reaching around 12.4°C. Today is expected to be a dry day, with a very low chance of rain. It will be quite a breezy day, with a maximum expected wind speed of 21mph. A beautiful friendly cellar door located in the Coal River Valley on the road to Richmond a historical town in Tasmania's south. 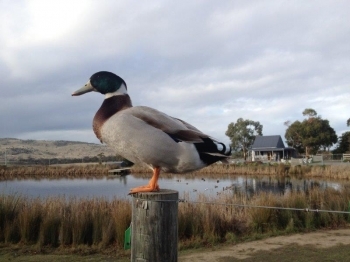 At Puddleduck you will be welcomed like family and are welcome to enjoy a sit down tasting of current releases whilst watching the ducks puddling or enjoy a reverse BYO® experience where you bring the food to have with our beverages. Either way you will enjoy stopping for a chat and tasting some beautiful Puddleduck wines!